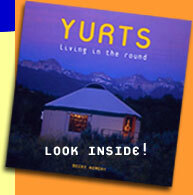 Yurtinfo.org was created by author Becky Kemery as a companion website to her book Yurts: Living in the Round. The purpose of this site is to be a comprehensive educational website on yurts providing both information and inspiration and assisting the worldwide yurt community in making connections. Please send your questions, feedback and any information you’d like to share with the yurt community to our contact form. After Becky’s passing in August of 2012, Jeff Capron, the owner of the Yurt Forum took over responsibility of maintaining Becky’s website in order to keep all her hard work available to the public at large. Becky Kemery lived in yurts for many years in the mountains of the American Northwest. Her book, YURTS: Living in the Round, was completed while living in her own portable fabric yurt on a permaculture homestead in North Idaho. Becky’s articles on sustainable building are available online at Alternatives Magazine and Hopedance. Jeff Capron currently owns a yurt in the Adirondacks in upstate New York and fosters online communication and knowledge about all aspects of yurts.